To use your Expend cards with Xero, you need to connect your company's Expend and Xero accounts and configure some syncing options. This only needs to be done once (but you can make changes in the future if necessary). Note: You can set up Xero syncing before you've received your Expend cards, and you can start using your card before setting up syncing – all the transactions are synced to Xero as soon as the setup is complete. Go to Expend dashboard at app.expend.io. In the dashboard menu, click Integrations, and then click Xero. Follow the steps to connect to Xero and configure syncing. All setup and configuration for syncing Expend with Xero is done on this page. The Xero Syncing box shows whether Expend is currently connected to Xero. Click the Connect button to connect your Xero account and your Expend account. You’ll be redirected to Xero. Log in to your Xero account and click Allow Access to authorise Expend to access your Xero data. You’ll be returned to the Expend dashboard to continue setup. To disconnect and stop syncing, simply click the Disconnect button. Expend needs three new accounts in your Xero Chart of Accounts. They will be used to record transactions made with Expend cards and to keep track of money loaded into your float account. Note: This step only needs to be completed the first time you set up syncing. You can create the accounts directly in your Xero Chart of Accounts, but we recommend using the Create Xero Account button on the Xero configuration page to quickly create new accounts with the appropriate settings. We also recommend creating new accounts instead of using existing accounts. Click the Create Xero Account button. Once you have entered the required details, click Create Account. In the drop-down list for the control account, select the account you created. When you have completed the steps for each control account in this section, click Save. When you submit an expense report for a transaction in Expend, you can select a category for that expense, such as Travel, Entertainment, Office supplies, and so on. Using the category you selected, Expend files it to the appropriate account in your Xero Chart of Accounts. 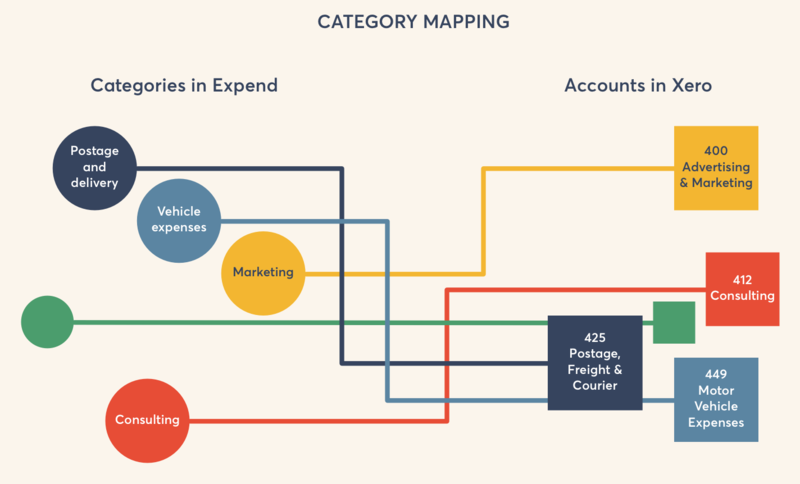 In this section, you can set up which Expend category maps to which Xero account. If you don't find the account you need, you can create one and Expend will set it up for you in Xero. Simply click Create Xero Account and, in the form that opens, select Expense as the account type and enter an account name and code. Note that the account will be created in Xero as with the account type “Expense” and tax setting “Zero Rated Expenses”. You can change this in your Xero Chart of Accounts if needed. You may want to review and approve expense reports from your organisation’s Expend card users before letting them sync to Xero. If so, set the slider for Require Review Before Syncing Expenses to the on position. Transactions will still sync, but expense details will only sync once an expense has been approved. If an expense is rejected, the transaction will be moved to the Rejected Expenses control account (see 2, above) so that it can be reclaimed from the cardholder. Note: If you change this setting in the future without making other changes to your configuration, please make sure you still click Save to apply the change. Since you normally need to have a copy of the receipt available if you want to claim tax for a purchase, Expend doesn't sync the tax type and percentage selected with Xero until a receipt is attached to an expense. However, if you turn the Send tax information even if an expense lacks a receipt on, the tax information will be synced with Xero even if no receipt is attached. Click Save to finish and save your configuration. If you make changes in the future, your updated settings will apply to all new transactions and expenses.